In its final game of the regular season, the No. 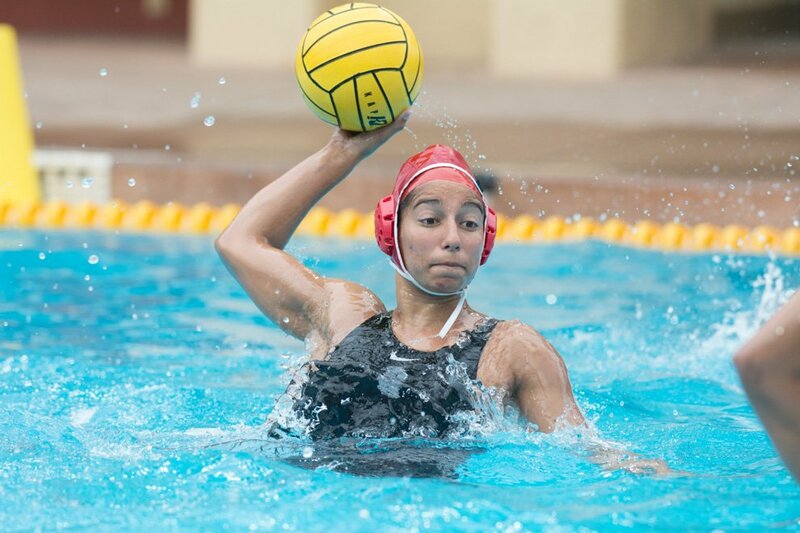 3 Stanford women’s water polo team (19-3, 4-1 MPSF) will look to bounce back from a tough 8-3 loss against No. 1 USC when it takes on the No. 2 UCLA Bruins (21-3, 4-1) on Saturday in Los Angeles. The game is the Cardinal’s last contest before the MPSF Championships next weekend in Bakersfield, and marks the first time the two teams have met since Stanford beat the Bruins in the finals of the 2015 NCAA National Championship. Gurpreet Sohi (above) is one of three Stanford players with over 30 goals this season, though seven others have at least 14. This depth on offense could come in handy as the team takes on No. 2 UCLA in a rematch of last year’s NCAA Championship, which Stanford won by a goal. matchup coming off a loss. Last weekend’s defeat at the hands of USC was Stanford’s second loss this year to the undefeated Trojans, one which also snapped the Cardinal’s eight-game win streak. Although Stanford came within two goals of the Trojans in the third quarter in Saturday’s game, they were unable to keep their momentum going to complete the comeback, mostly due to their offensive struggles: The game marked the second-worst scoring performance this season for a Cardinal offense that has usually been prolific in finding the back of the net. All three of the team’s losses have come when they have scored 6 goals or less, despite the fact that they average over 12 goals per game. With the regular season coming to a close, the squad will be looking ahead to the playoffs and its ultimate goal of winning a national championship — its fifth in six years. The team’s No. 3 ranking reflects the strength of its play thus far, but in order to repeat last year’s title, the Cardinal will need to focus more on playing together as a singular unit rather than a group of individuals. One formidable test, however, stands between the Cardinal and the playoffs this weekend when they will face the second-ranked Bruins, one of the few top-ranked teams that they have yet to play. In addition to being a preview for a possible conference playoff or NCAA tournament matchup, the game will give the Cardinal an opportunity to get used to the UCLA facilities that will be utilized during the NCAA Championship. UCLA has played strongly this season, with its three losses all coming to the undefeated Trojans. The Bruins’ most recent defeat snapped a nine-game winning streak. Over the years, the Stanford and UCLA programs have competed a total of 70 times, with the Cardinal holding a 39-31 lead. The game will most likely determine who is the second seed in the MPSF tournament behind USC. While the tournament is important, it is not the be-all and end-all for the season, as last year, the Bruins won the MPSF tournament while the Cardinal went on to win the national championship. That doesn’t mean, however, that Stanford won’t come out hungry to win against such a fierce rival. “You don’t get great at anything by holding back,” Tanner said. “We don’t hold back in practices, we don’t hold back in games. We don’t try to maneuver from one weekend to the next. We do our best to prepare and be sharp every weekend. “I also love the fact that our teams have prepared themselves to be at their best at the most important times,” he added. The Bruins will also be looking to get revenge after the Cardinal beat them in last season’s national title game, a 1-point win that featured a controversial call that gave Stanford a goal off a penalty shot. To keep the Bruins and their designs for revenge at bay, the Cardinal offense, which at certain points in the season led the league in goals, will be the driving factor, one that could push the team into the late rounds of postseason tournaments. The offense gains most of its advantage from its depth: While three players (Jamie Neushul, Kat Klass and Gurpreet Sohi) lead the team with at least 30 goals apiece, there are seven other players with at least 14 goals. Such versatility has proved to be a nightmare for opposing defenses. Tune in to watch the Cardinal take on the Bruins on Pac-12 Networks at 11:30 a.m. this Saturday in Los Angeles. Contact Yousef Hindy at yhindy@stanford.edu.